Thanks to Dr. Raul Gonzalez, University of Rochester Medical Center, New York (USA) for contributing this case. To contribute a Case of the Week, follow the guidelines on our main Case of the Week page. 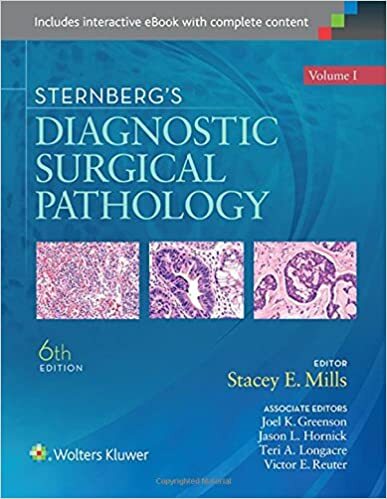 Don't forget to check out more Top Books for Pathologists that were sold in 2015, through Amazon, by visiting our Top Books page! (1) We send out a maximum of one Commercial Email each month. When you receive our Commercial Emails and read them, there are easy to follow instructions that tell you how to enter into a drawing for a $50 Amazon.com gift card. It's that easy! You can sign up to receive these informative emails by clicking here. 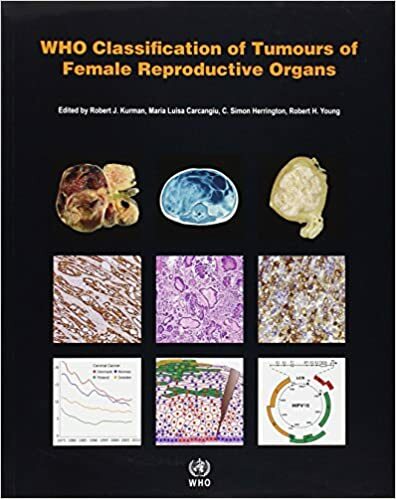 (2) For the fourth quarter of 2015, we earned $5,805.22 from Amazon.com sales through PathologyOutlines.com. We are donating 10%, or $580.52, to St. Jude Children's Research Hospital. We plan to continue to donate 10% of Amazon earnings to a charity related to medicine / health care. We welcome your suggestions of charities, and will announce the charity for the first quarter of 2016 within a few weeks. (3) For 2015, our website traffic increased 11% to a record 7.7 million visits from 6.9 million visits in 2014. The average visits per day was 21,074. We had a 38% increase in page views to a record 29.3 million in 2015 from 21.3 million in 2014. There was also record traffic on our Jobs page (505,183 page views), Fellowship pages (78,974 page views) and Conference page (103,403 page views). See our Statistics page for more details. 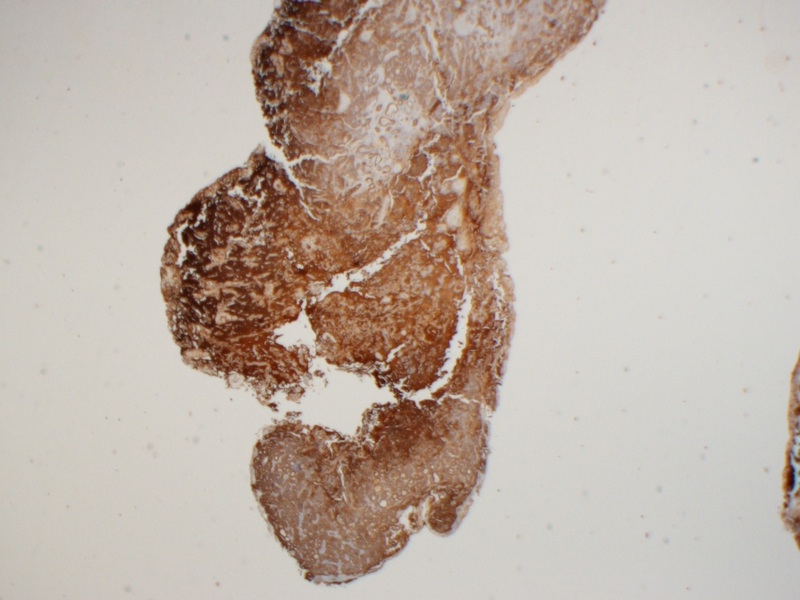 A 63 year old woman presented with a 1.0 cm middle ear mass, which was excised. Middle ear adenoma is a term traditionally used for a rare and benign yet distinctive tumor of the middle ear mostly seen in patients 20-40 years of age (Rosai and Ackerman's Surgical Pathology, 2011). 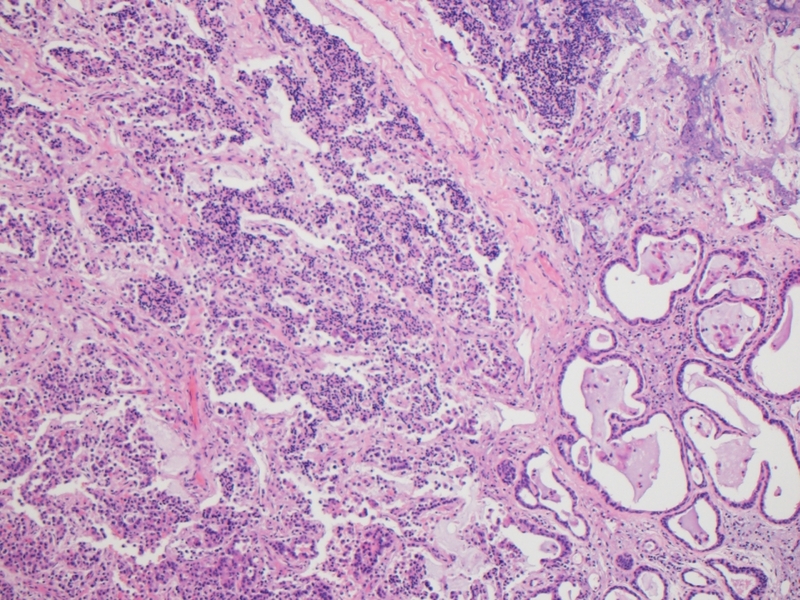 The tumor originates from the middle ear mucosa, and patients usually present with hearing loss, a mass lesion or pain (Mod Pathol 2002;15:543). 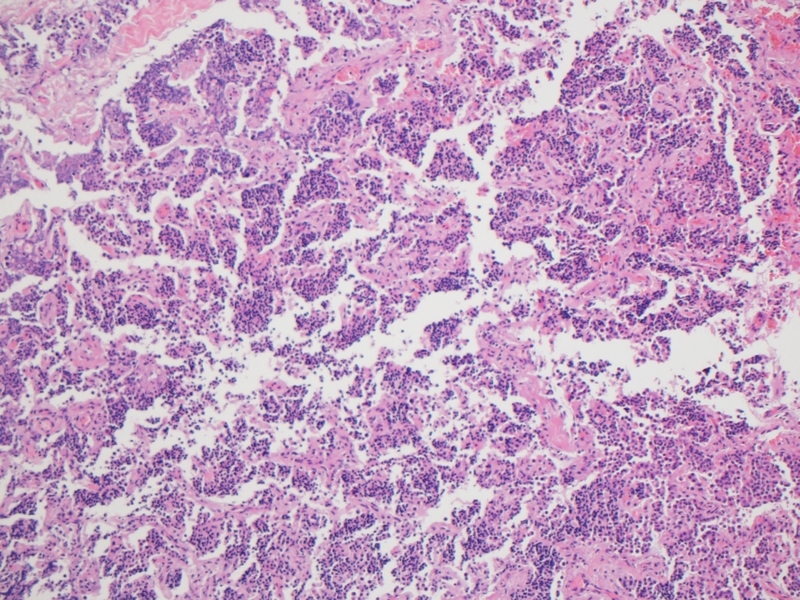 Grossly, the tumors are grey-white and well circumscribed, but not encapsulated (Rosai and Ackerman's Surgical Pathology, 2011). 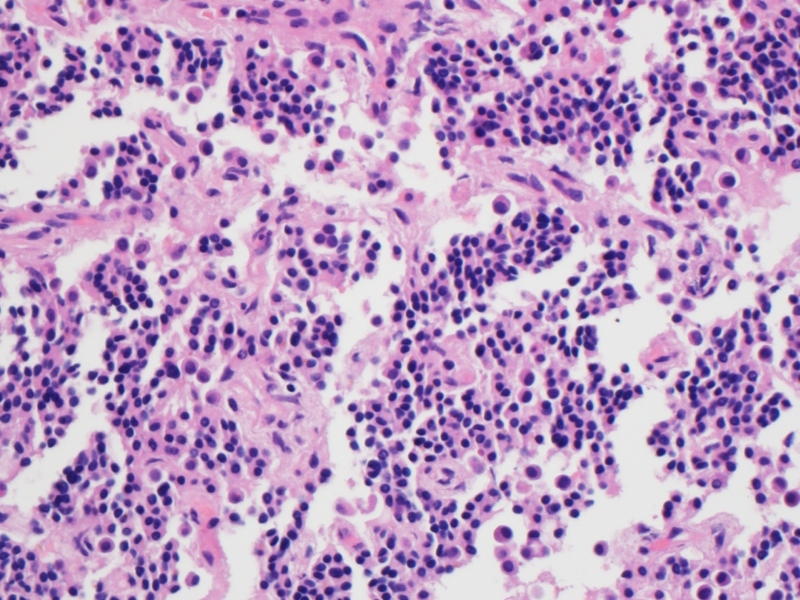 Histology shows a proliferation of uniform, cuboidal cells arranged in a solid, glandular or trabecular pattern. 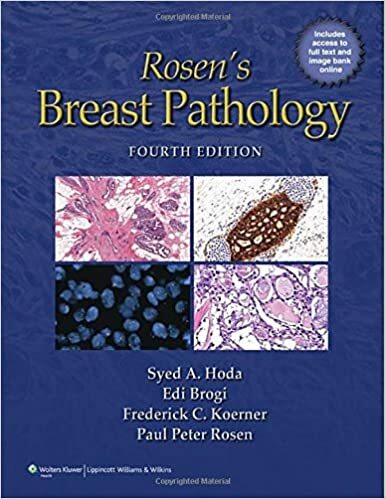 Papillary architecture is not a feature, and if present, suggests papillary adenocarcinoma (Rosai and Ackerman's Surgical Pathology, 2011). 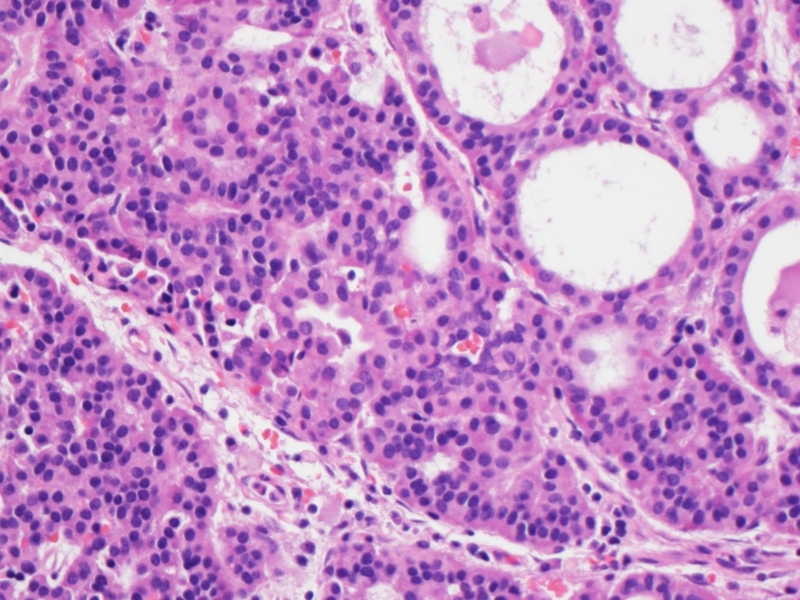 These tumors contain a moderate amount of eosinophilic cytoplasm and "salt and pepper" nuclear chromatin. 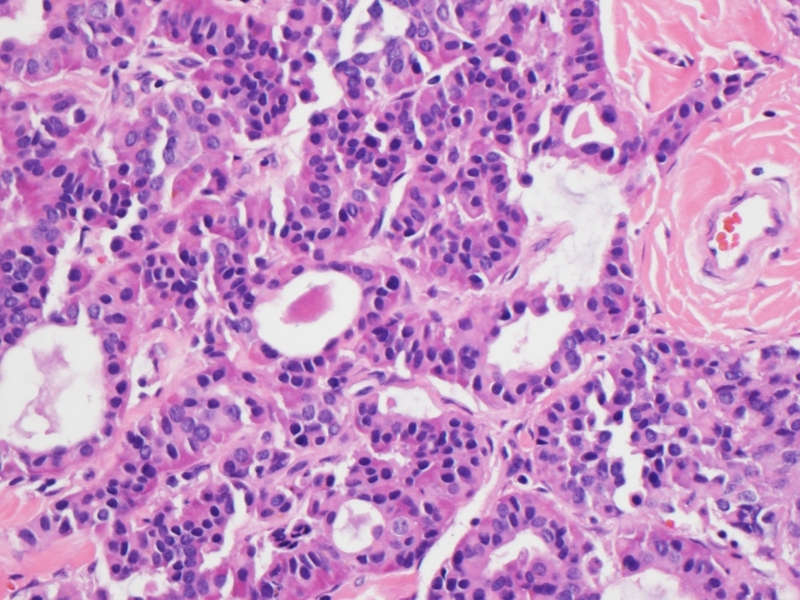 Mitoses are rare, pleomorphism is minimal and necrosis is absent (Rosai and Ackerman's Surgical Pathology, 2011). 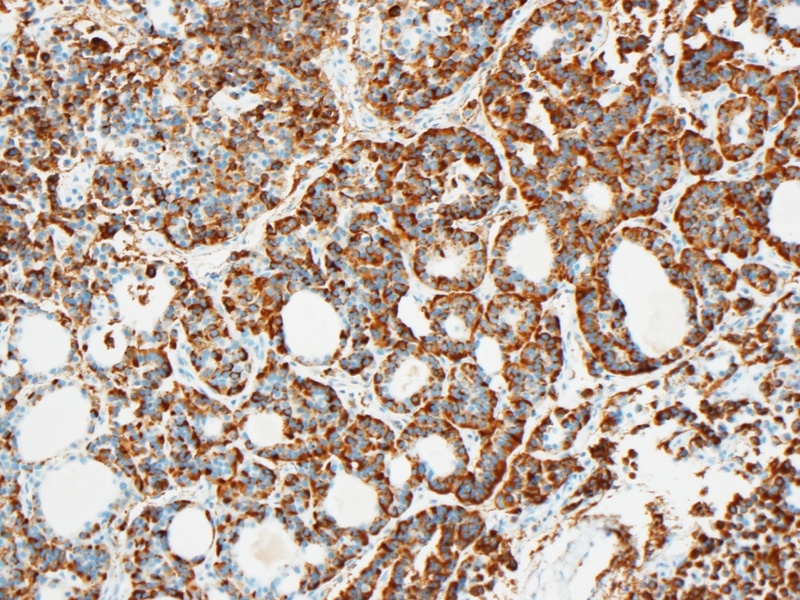 Mucin producing tumors are positive on Periodic acid-Schiff, Alcian blue and mucicarmine stains (Am J Surg Pathol 1984;8:677), and by immunohistochemistry the cells are positive for cytokeratin and lysozyme. 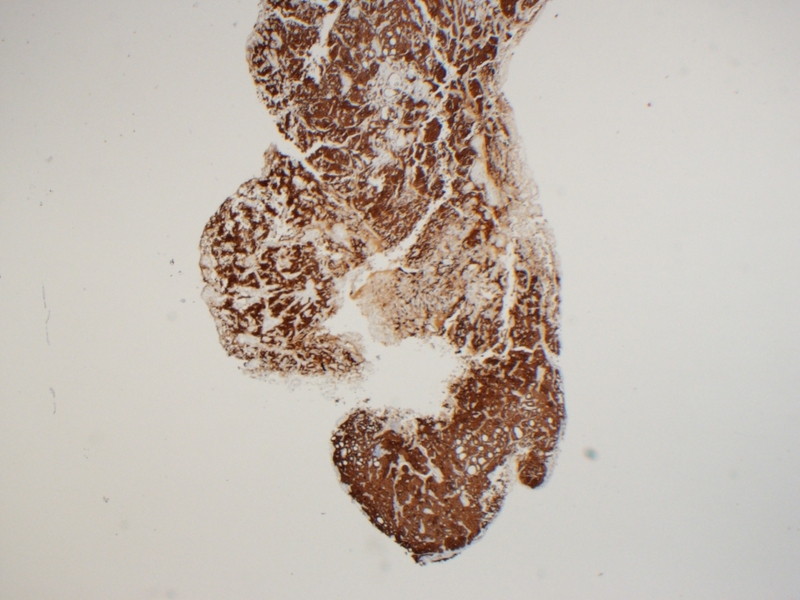 There is significant clinical and morphologic overlap between middle ear adenoma and carcinoid tumor of the middle ear, such that many studies suggest that these are essentially indistinguishable benign tumors (Mod Pathol 2002;15:543). They may show mixed patterns of differentiation, with both exocrine and neuroendocrine components (Rosai and Ackerman's Surgical Pathology, 2011). 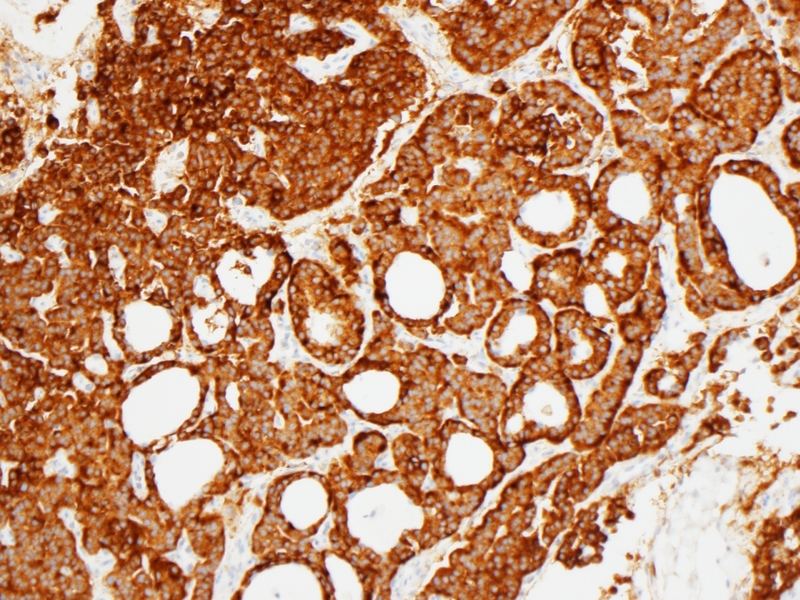 The neuroendocrine component is supported by the presence of dense-core granules ultrastructurally (Arch Pathol Lab Med 2006;130:1067), and immunoreactivity with chromogranin, neuron-specific enolase, synaptophysin and human pancreatic polypeptide (Mod Pathol 2002;15:543). The term "neuroendocrine adenoma of the middle ear" has been proposed as a more descriptive designation (Mod Pathol 2002;15:543). 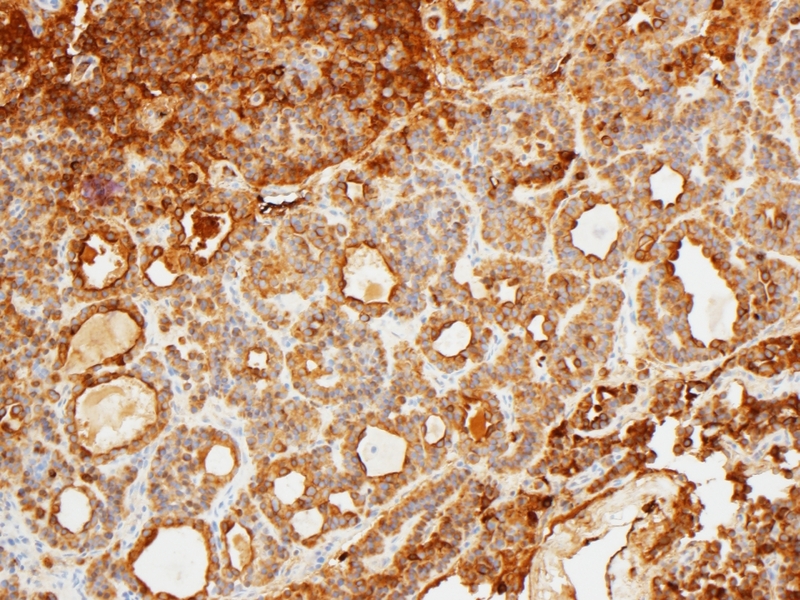 The differential diagnosis includes acoustic neuroma, paraganglioma, schwannoma and middle ear adenocarcinoma (Arch Pathol Lab Med 2006;130:1067). 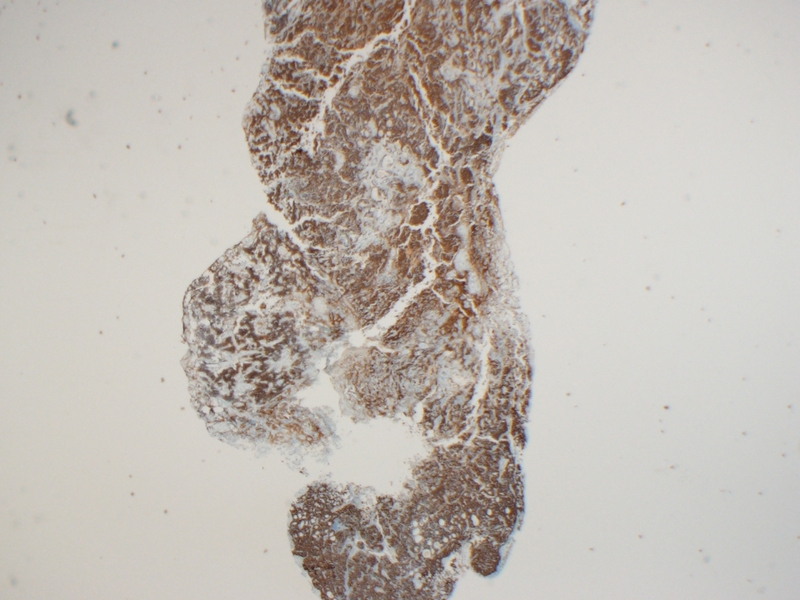 Paraganglioma shows the distinctive zellballen pattern with S100+ sustentacular cells. 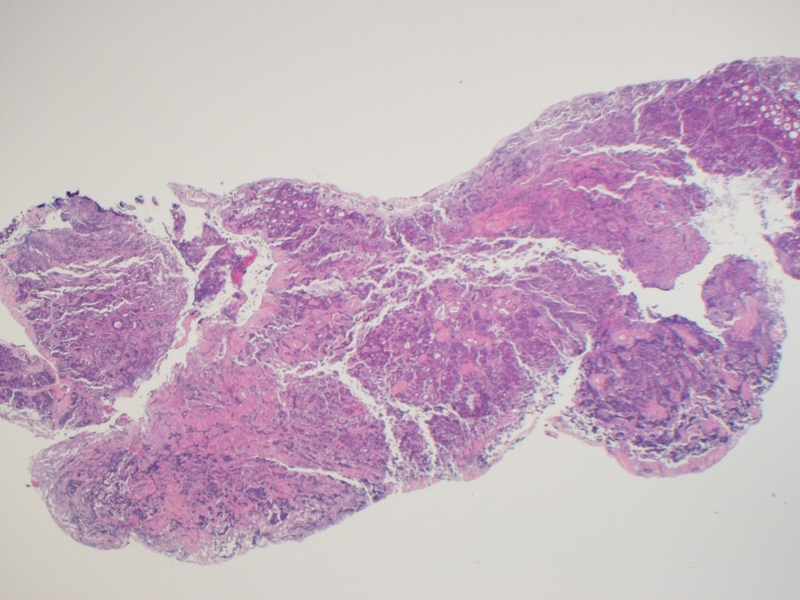 Schwannoma, a benign nerve sheath tumor, shows the characteristic hypercellular (Antoni A) and hypocellular (Antoni B) areas and may contain Verocay bodies. 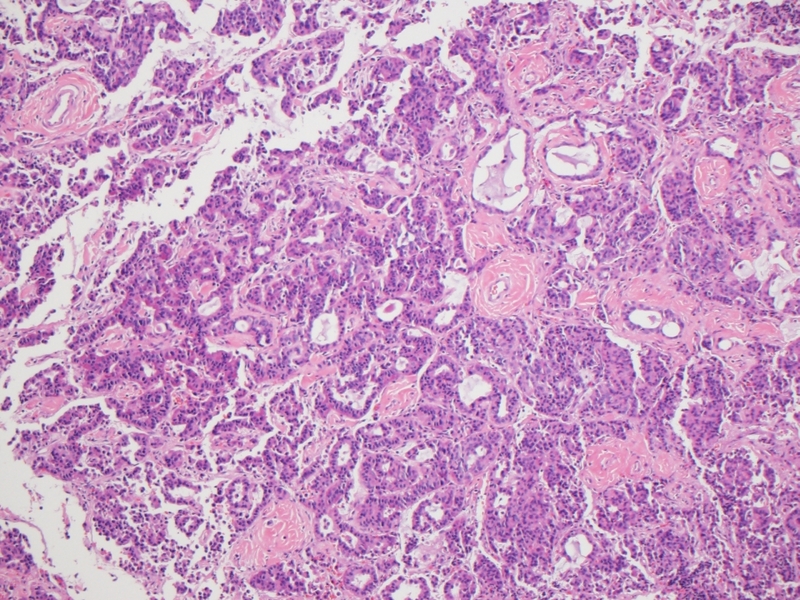 Features such as marked pleomorphism, mitotic activity, necrosis and invasion into adjacent structures distinguish adenocarcinoma from middle ear adenoma. 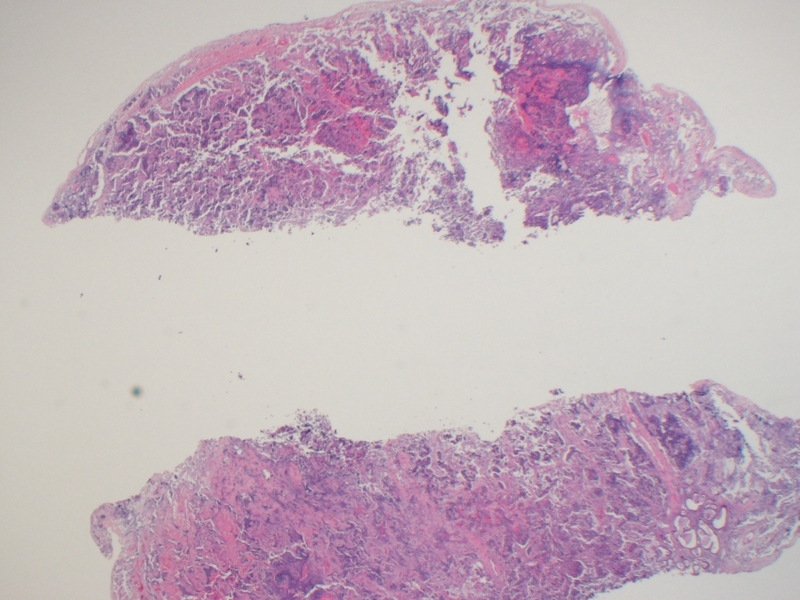 Treatment is surgical excision and prognosis is excellent, with only occasional local recurrence and very few reported cases of regional metastases after years of disease (Rosai and Ackerman's Surgical Pathology, 2011, Laryngorhinootologie 2009;88:186). As there may be difficulty in obtaining a complete surgical excision, frequent follow up examinations have been recommended, in addition to adjuvant radiotherapy in particularly complicated cases (Laryngorhinootologie 2009;88:186, Laryngoscope 2005;115:1660). 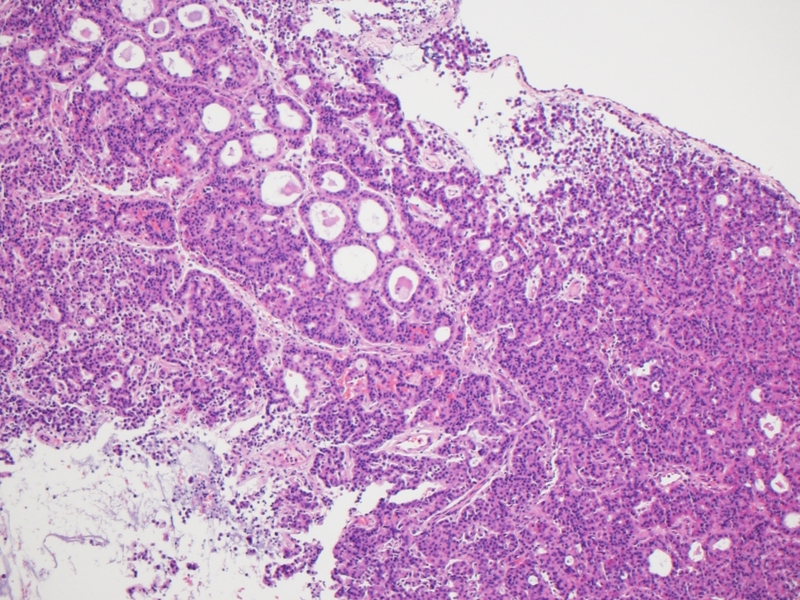 Extension through the tympanic membrane has been reported (Pathology and Genetics of Head and Neck Tumours, 2005).